Welcome back. In case you didn’t take notes when reading the last blog post, I’ll remind you that, globally, spiders devour some 400 to 800 million metric tons of insects each year, and over 95% of that total is attributed to spiders in forest and grassland (Spiders’ Sumptuous Repast). Even if you didn’t see the post, you’re likely aware that a few non-forest, non-grassland spiders may reside in your home. They’re there for a reason, which is to say they’re not going hungry. I can say that because a study offered insight into the arthropod populations in our homes. Simulated arthropod in the house. Before continuing, I must note that arthropods are animals with no spine, a hard outer skin and legs with bones joined together. They include insects (beetles, bees, ants, flies, moths), arachnids (spiders), myriapods (centipedes, millipedes) and crustaceans (wood lice, crabs and shrimp). “Bugs” is a colloquial term for any insect class and small arthropod. True bugs are hemipterous insects--those with forewings and mouthparts modified for piercing and sucking, such as cicadas and aphids. Now, back to the research. 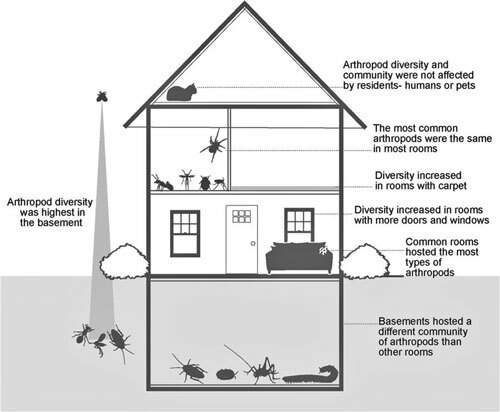 Collaborating scientists affiliated with the California Academy of Sciences, North Carolina State and Rutgers universities and the Natural History Museum of Denmark examined how arthropod diversity and composition are influenced by the layout of our houses as well as by our lifestyles. Entomologists surveyed and exhaustively sampled living and dead arthropod specimens in every room of 50 houses within 65 kilometers (about 40 miles) of central Raleigh, North Carolina. They collected over 10,000 specimens of 304 arthropod taxonomic families. The houses, which averaged 41 years in age (7 to 94), hosted an average of 62 distinct arthropod families (24 to 128). To assess the occurrence and distribution of arthropods among rooms and the influencing factors, the researchers categorized 531 rooms as attics, basements, bathrooms, bedrooms, common rooms or kitchens; carpeted or bare-floored; and occupying the subterranean, ground or above-ground house level. Of the 304 arthropod families encountered, they included only those families found in at least 20 of the 50 houses, in at least 4 rooms in a house. What and Where Were the Arthropods? - Most arthropod species were not primarily indoor inhabitants but simply filtered from the outside. 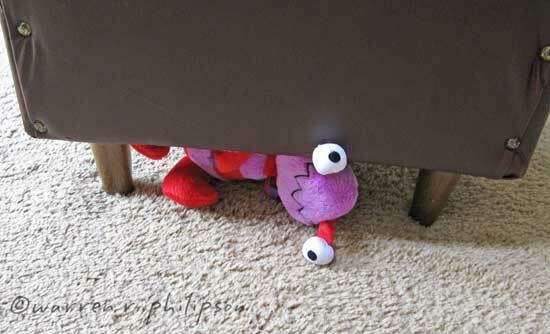 - As the number of doors and windows increased in a room, so too did the arthropod diversity. - Arthropod diversity in rooms tended to decrease the higher the floor level. - Basements and common rooms appeared to host arthropod communities with significantly different compositions compared to the more homogenous communities of bathrooms, kitchens and bedrooms. - Arthropod communities in all rooms exhibited a food-chain (trophic) structure with predators (spiders, ground beetles), house-associated scavengers and fungus feeders (ants, carpet beetles, book lice, drain flies, silverfish) and transients from outdoors (non-feeding flies, leafhoppers, springtails). - Carpeted rooms had greater arthropod diversity than did rooms with bare floors. - Arthropod diversity and composition did not vary significantly based on presence of cats or dogs, number of houseplants, pesticide usage or relative levels of clutter and dust accumulation. Overall, the study found the indoor arthropods were largely a reflection of the outdoor arthropods and thus strongly influenced by access to the outside. Human behavior appeared to have little influence. Though the study was relatively small, focused on only one geographic region, the work is expanding internationally. The results could be quite different in your area. Nevertheless, that they found an average of 62 arthropod families in the study area houses might induce you to invite a spider or two inside for animal control.